Part of the fun of Manhattan Cocktail Classic‘s Industry Invitational are the tasting rooms. 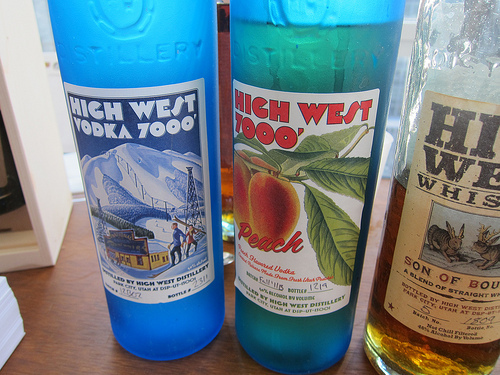 I hit up High West and Oxley Gin for a taste. I am familiar with High West, the distillery in Utah. I enjoy their Son of Bourye and Double Rye. I tried their new Rendezvous Rye and Campfire. While the Bourye and Double Rye are very smooth, I felt the Rendezvous was a bit rougher. I was told it’s a blend of whiskeys that haven’t been aged as long. And if you are a fan of peaty Scotch, then Campfire is for you. It is a blend of Scotch, bourbon and rye. I didn’t realize they made vodka as well. I recently met someone from Utah who enjoyed their Peach vodka. 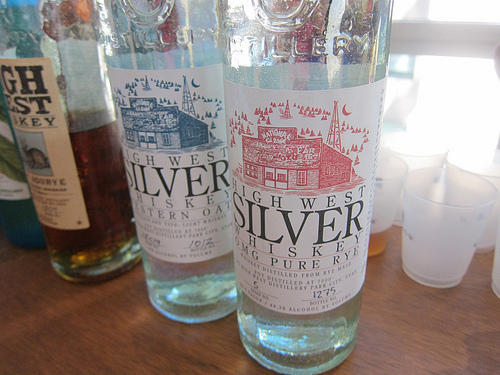 High West also has silver whiskeys; Western Oat and OMG Pure Rye. The OMG stands for Old Monogahela rye. The Monogahela is a river in Western Pennsylvania where there were many distilleries in the 1800s. 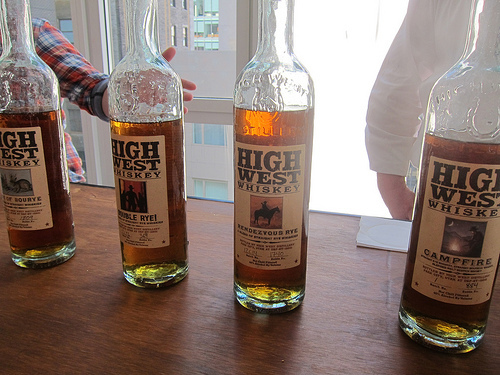 High West uses an old recipe for its 80% rye and 20% malted rye OMG. Although the words “liquid fire” come to mind, I didn’t mind it but I’d like to try an aged version. 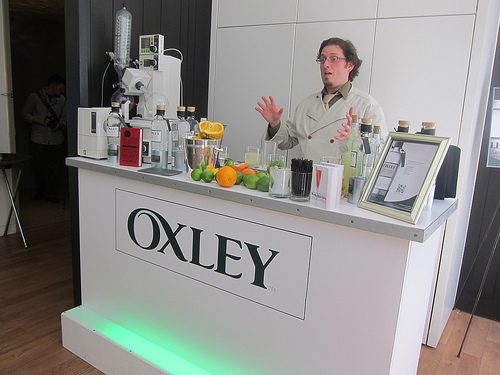 Next door mixologist Jonathan Pogash was speaking about Oxley Gin. He recently edited the 75th edition of Mr. Boston Official Bartender’s Guide. He mentioned updating some drinks to reflect the modern palate. 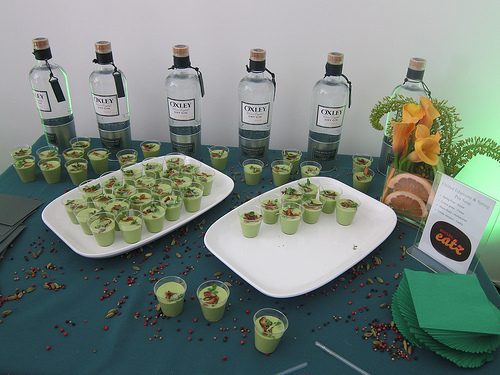 I have mentioned this before but I really did love how everyone had some sort of food and the trend of pairing food with cocktails. As I enjoyed my Southside cocktail, I also had a very nice pea soup with mushrooms. At High West, I had an Australian Meat Pie from a local NY shop. This entry was posted in alcohol education, alcohol tasting, bartenders, cocktail week, cocktails, events, history, hot bartenders, spirits, the minty, travel and tagged alcohol education, alcohol tasting, bartenders, cocktail week, gin, high west bourye, high west campfire, high west distillery, high west vodka, high west whiskey, jonathan pogash, manhattan, manhattan cocktail classic, mcc, ny, nyc, oxley gin, the minty, travel, utah, whiskey. Bookmark the permalink. Many thanks for stopping by our tasting room during MCC…and for writing us up! Just to clarify, Rendezvous is actually a blend of two straight rye whiskies…a six year-old and a sixteen year-old. It’s actually a more-aged version than its counterpart, Double Rye (which is a blend of a two year-old and a different sixteen year-old). If you find yourself heading to Utah, please let me know. I’d be happy to show you around our distillery, saloon and restaurant. Oh very interesting. I had mentioned it seeming rougher when I tasted and the guy said it was because they were younger ryes. Perhaps he meant just one of the ryes then? Absolutely, I will let you know if I ever swing by High West.